I have a new product line to share that I am really excited about. Wow, this is the second line in one year to strike a fancy with me-awesome! Even though I am in the middle of the 31 days, if something else arises that is amazing, please know I will share. I am going to try to keep this as short and sweet as possible but the is a good amount of product info and Neuma background to cover that I feel is VERY important. In nature, nothing exists in isolation because everything is connected. We believe the same is true for beauty... everything is connected. 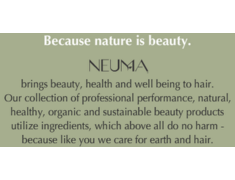 NEUMA is a transparent brand...meaning, they disclose everything their products. ZERO synthetic fragrance, sulfates, sodium chloride, parabens, 1,4-dioxane, phthalates, glutens, neurotoxins, aluminum compounds, glycols, formaldehyde donors, ureas, carcinogens, environmental pollutants - simply a genuine, sustainable brand. Their scent is all AMAZING! I was worried about it being way too earthy and a lack of lather. The scents were explained to me as citrus, vanilla and sweet almond-heavenly. The shampoo lathers ok (which lather is actually cheap, filler ingredients-but some of you still love that) and the comb slips through like butter while it is wet after applying the leave-on and argan. My hair has never looked and felt better!